Frida Kahlo was born Magdalena Carmen Frida Kahlo y Calderon in Mexico City on 6th July 1907, although she often gave her date of birth as 1910. She was the daughter of a German-Jewish photographer father and a Mexican Catholic mother. At the age of six she was stricken with polio, which left her with a permanent weakness in her right leg. She grew up wanting to be a doctor, but a serious bus accident in 1925 destroyed that dream. She broke her pelvis, collarbone and several ribs. Her already weak right leg was fractured in eleven places. Kahlo needed more than thirty operations and spent so much time in bed that she taught herself to paint to combat the boredom. Frida had first met her future husband, Diego Rivera, while she was a schoolgirl at the National Preparatory School - he had been commissioned to paint a mural in the auditorium. She showed him some of her early work and he encouraged her to continue painting. They married in 1929. 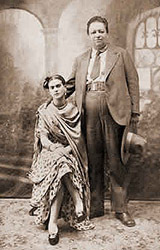 After their marriage Kahlo travelled with Rivera across the United States and Mexico when he took commissions for his murals, but theirs was a tortured marriage, including rumours of domestic violence and adultery on both sides. One well founded rumour is that she had an affair with close friend and well known communist activist and writer Leon Trotsky. Both Kahlo and Rivera were investigated when Trotsky died under suspicious circumstances, although neither were charged. Frida and Diego divorced in 1940, but unable to be apart they remarried in 1941. Also in 1940 she participated in the International Exhbition of Surrealism in Mexico City. In 1943 she was made a professor of painting at the School of Fine Arts. At the Annual National Exhibition at the Palace of Fine Arts in 1946 Frida won a prize. She only held one full exhibition in Mexico, and that was in 1953. She was in poor health and her doctors advised her not to attend. She instead had herself taken to the gallery in an ambalance and set up a bed inside, where she held court. Later in 1953 her right leg had to be amputated, which left her suffering from depression. She died on 13th of July 1954. No autopsy was performed so it is hard to say what she died of, although possibly she took her own life, as she had attempted to end her life more than once before. 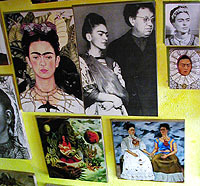 After her death her house, now known as the Blue House, became the Frida Kahlo Museum. Frida Kahlo used painting as an outlet for her feelings of anger and pain. She began painting after her terrible accident and continued throughout her torturous marriage. Frida expressed her own suffering, and the suffering, both physical and emotional, of all women, through her art.